THE BRILLUSTRATOR: When turtles fly! Ok, I can't even PRETEND this took less than 50 minutes. :P So, as far as it being a quick sketch--total FAIL. However, I think I can be forgiven--I've always had a soft spot for the Heroes-On-A-Half-Shell. 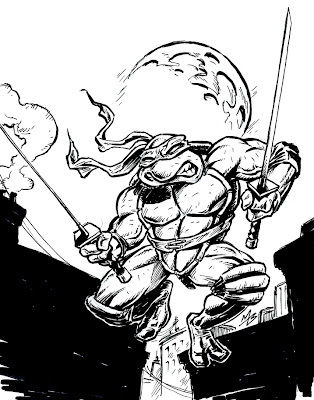 And when I saw a new--and quite exquisite TMNT pic by Kevin Eastman the other day, promoting the new IDW TMNT book, I was inspired to get carried away. Plus, I always liked drawing the Turtles! So Kevin Eastman and Peter Laird--this sketch is for you guys! And best of luck with the new TMNT series!